Slow-absorbing casein protein is great before bed. 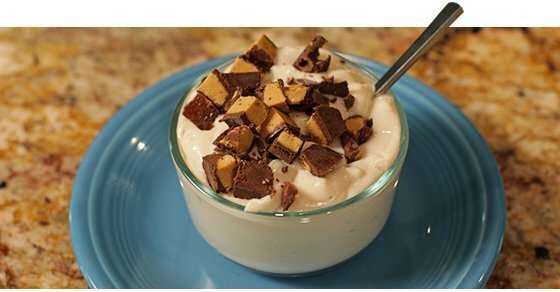 This recipe utilizes the muscle-building properties of casein in a sweet tooth-friendly snack! I'm not sure desserts get any better than delicacies with peanut butter and chocolate. Actually, I'm sure they don't. This recipe includes both of those mouth-watering ingredients, but it's even better because it also has that extra special macronutrient: protein. If you can't have your usual cookies and milk before bed, this is the next best thing. So grab a giant bowl and mix away. Five ingredients and 10 minutes later, you'll end up with my protein peanut butter fluff recipe! Use it as a high-protein, low-carb, and low-sugar bedtime snack so you can build muscle while you sleep.